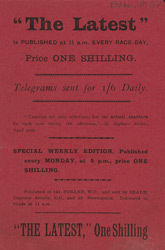 Production of specialised journals such as The Latest, featured in this leaflet, multiplied during the 19th Century. Sport became very popular during the Victorian period, and periodicals featured articles on all sorts of sporting events like athletics, swimming competitions and most often horse racing. The races, jockeys and trainers could be detailed and discussed and the results published very quickly so that people all around the county could read about them.